This week, the Prime Minister launched a bold 25 Year Environment Plan, with a strategy for a cleaner, greener Britain that will leave our environment in a better state than we found it for the next generation. 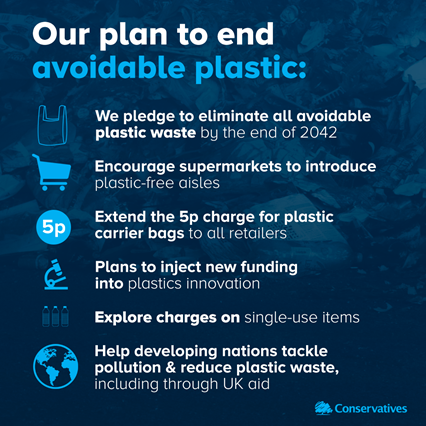 This includes a pledge to eliminate all avoidable plastic waste by the end of 2042, encouraging supermarkets to introduce plastic-free aisles, extending the 5p charge for plastic carrier bags to all retailers and issuing a consultation on taxing the most environmentally damaging plastics. All this builds on the Government’s work in recent months for environmentalism that is central to conservatism. · Pledge to eliminate all avoidable plastic waste by the end of 2042. We know that we must reduce the demand for plastic, reduce the number of plastics in circulation and improve our recycling rates and that is why we have taken this significant step. · Encourage supermarkets to introduce plastic-free aisles in which all the food is loose. This will give people the choice to make greener decisions and promote the use of less damaging plastic packaging. · Extend the 5p carrier bag charge to all retailers in England. 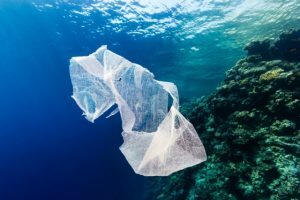 To date, nine billion fewer plastic bags have been used as a direct consequence of introducing the charge.This has led to a reduction of 83 per cent and £95 million has been donated to environmental educational, and other good causes. · Call for evidence next month on a new charge or tax on single-use plastic items, such as takeaway containers. This will encourage industry to take more responsibility for the environmental impacts of their products and make them easier to recycle. · Inject new funding into plastics innovation through a bid into the government’s £7 billion research and development pot. · Support a Northern Forest. It will be a new community woodland for Cheshire, Lancashire and Yorkshire, provide a new and enduring amenity for the growing population of the north of England, and act as a carbon sink for the UK. · Allow young people to learn more about the natural world, targeting schools in disadvantaged areas first. This will be supported by £10 million of investment. · Supporting further restrictions on neonicotinoids and have banned microbeads. These are significant steps toward protecting bees and our marine environment. 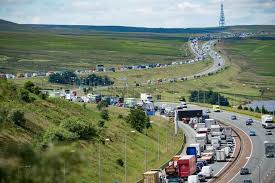 · Providing £3.5 billion to support measures to improve air quality. Investing in electric vehicle infrastructure and new charging technologies, supporting the roll-out of low carbon buses, and expanding cycling and walking infrastructure. In the last Budget announced a £220 million Clean Air Fund, paid for by tax changes to company car tax and vehicle excise duty on new diesel cars. · Ending the sale of all new conventional petrol and diesel cars and vans by 2040. · Doubled maximum litter fines to £150. From April, the new range will be £65-150, with a default of £100. · Releasing beavers to the Forest of Dean, to help reduce the risk of flooding and enhance biodiversity. Beavers are to be introduced into a 6.5 hectare secure enclosure in the Forest of Dean in the spring. Overall this plan and existing actions are the boldest and most radical plan to support the environment brought forward by a Government. The Conservative Government will introduce legislation to implement a ban on the use of microbeads in both cosmetic and personal care products. This is part of an effort to restore the health of our marine environment. For example, the 5p plastic bag charge has reduced use by an incredible nine billion+ bags – enough to wrap around the world more than 100 times. Legislation will be brought forward later this year to ban the use of microbeads in personal care products. Adding tiny pieces of plastic to products like face washes and body scrubs is incredibly damaging to our sea life – they can swallow them – but cannot digest them. 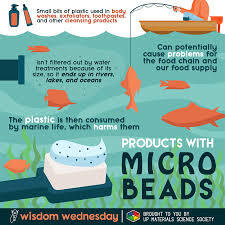 Already we are seeing retailers and manufacturers are already taking action to phase out microbeads. With the legislation, which will be brought forward later this year, will make sure that in future microbeads will have no place in personal care products, like shower gels and face scrubs, that end up going down the drain.